LeRoy Troyer believes in a working board. 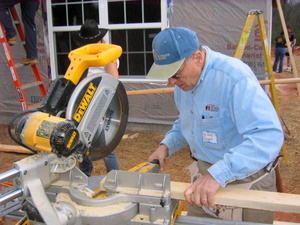 He is the architect and founder of The Troyer Group, a 60-person firm, and for decades traveled the world with his friends Millard Fuller and President Jimmy Carter, spreading the Theology of the Hammer and building homes. Now, LeRoy is finally able to bring his passions home with the launch of The Fuller Center’s newest covenant partner in LeRoy’s home county of St. Joseph in Indiana. St. Joseph was formed in 1830 and named for the St. Joseph River, which flows through it toward Lake Michigan. With the census reporting approximately 10.5 percent of its residents living below the poverty line, the FCH St. Joseph board has set a long-term goal of eliminating substandard housing in the county in 20 to 30 years. They will do this in collaboration with other, like-minded organizations. To get things started, the new board will try to have at least one Greater Blessing project dedicated in time for the Millard Fuller Legacy Build (August 31 through September 4th). During that week, the leadership of the Fuller Center’s covenant partner in the town of Lanett, Ala., – the epicenter of the build and where Millard grew up – will pass the hammer off to Fuller Center board member Jeff Cardwell. His Indianapolis team will be the central host site for the 2010 Millard Fuller Legacy Build. LeRoy is also passionate about the environment and is already lending his knowledge and experience to The Fuller Center. Beginning in 1968, he initiated, organized and then served as Secretary General of the organization and planning committee for the first International Youth Conference on the Environment, held in Canada in 1971. Recently, LeRoy gave a lecture at Koinonia Farm in Americus, Ga., to the Georgia Permaculture Design Certification Course. In May, he spent time in Peru helping The Fuller Center explore possibilities for implementing some of the permaculture strategies in the community it is constructing.